With the NBA Draft less than 24 hours away, and nearly 7000 votes posted on the Philly.com end of season “76ers Stay or Go Fan Vote”, it is apparent that the 76ers fans aren’t happy enough with upsetting the Chicago Bulls in the first round of the playoffs, and taking the Boston Celtics to 7 games in the second round. The fans are voting for a housecleaning of the current players. The Philly.com end of year tradition allows fans to vote which individual players should “stay” or “go” before next season. These polls are enjoyable because only the rabid fans bother to vote. When the Eagles voting was completed in January, we broke down the results and shared them with you. Following is the link to that article. https://phillypressbox.wordpress.com/2012/01/08/eagles-stay-or-go-fan-vote/. Interestingly enough the fans wanted Asante Samual gone, and the Eagles have obliged. We recently posted the Flyers “Stay or Go” results and the fans wanted James van Riemsdyk gone, and the Flyers management has obliged. Does team management really pay attention to what the fans want? Following is the link to the Flyers results. https://phillypressbox.wordpress.com/2012/05/30/flyers-stay-or-go-fan-vote/. Here’s how it works. You go on the site and vote “stay” or “go” for each player. Once you’ve voted on the player the current vote result is shown. You can vote as many times as you choose. We were very surprised with the Eagles results and somewhat surprised with the Flyers results, but based on these fan results the 76ers would be close to starting over. 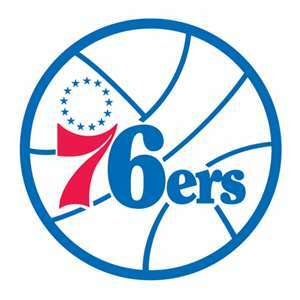 There were a total of 14 players listed plus Head Coach Doug Collins and General Manager Rod Thorn. Using 50% “stay” versus 50% “go” here are the results. The players that will be “staying” are Lavoy Allen with 96.5% “stay” votes, Jrue Holiday with 94.5% “stay” votes, Evan Turner with 89.0% “stay” votes, Thaddeus Young with 84.8% “stay” votes, Nikola Vucevic with 81.0% “stay” votes and Lou Williams with 63.9% “stay” votes. That’s it folks! These are the only players that you voted to stay for next season. This doesn’t look like a team that will advance past the second round of the playoffs by adding a couple draft pick. Following are the percentage of “go” votes for the remaining 8 players. The lightening rod, and the only 2011-12 All Star, Andre Iguodala, received 51.7% “go” votes. With the 7000 votes cast, Iggy was the closest to a 50/50 vote of any of the players. The fans are split almost down the middle on keeping the All Star. Spencer Hawes and Jodie Meeks each received 55.3% “go” votes, Sam Young received 68.0% “go” votes, Craig Brackens received 79.7% “go” votes, Xavier Silas received 80.9% “go” votes, Eldon Brand received 82.3% “go” votes and Tony Battle received 86.4% “go” votes. If the 76ers were without all of these players next year they would have no one on the bench and would’ve changed out half of it’s starting line up. As far as Collins and Thorn the fans are happy. Colllins received 94.0% “stay” votes while Thorn received 66.7% “stay” votes. There you have it. The Philadelphia 76ers fans have spoken. How will the team help themselves in the draft on Thursday night and will they make moves to unload players that the fans voted to “go”? Lets get to know the Philadelphia Flyers 2012 – 1st round draft choice, Scott Laughton. Laughton stands 6’0” and weighs a light 177 pounds. He turned 18 years old May 30. He is a native of Oakville, Ontario. Laughton began his career in 2009-10 with the Toronto Marlboros where he scored 55 goals and 95 points in 72 games, while accumulating 109 penalty minutes. Following the 2009-10 season Laughton was drafted 3rd overall in the 2010 OHL Priority Selection by the Oshawa Generals. In 2010-11, Scott scored 12 goals and added 11 assists in 63 games. He added 58 penalty minutes. As a 17- year old in 2011-12 Laughton stepped up his game. He scored 21 goals and added 32 assists in 64 games with 101 penalty minutes. The expectations seem to be that Laughton will need to spend some time in the minors before making the Flyers. The hope here is that he develops in to the player that warrants being selected #20 in the draft. Of everything we’ve seen, and heard, on Scott, the thing we’re the most impressed with is part of the quote above, “Laughton is a high character player who is willing to do whatever it takes to win.” I’ll take a team full of players like that any day. Welcome to the Flyers Scott Laughton. Feel free to click the FOLLOW button on the bottom right of this page, input your email address and receive your Philly Pressbox posts directly in your email. As always, feel free to COMMENT on any article. While on our 30th anniversary vacation trip to Las Vegas my wife and I were site seeing through one of the many casinos. As we walked through the mammoth and beautiful Caesars Palace, and its many stores, we saw a store named “Antiquities”. “Antiquities” is a store full of memorabilia of all types. 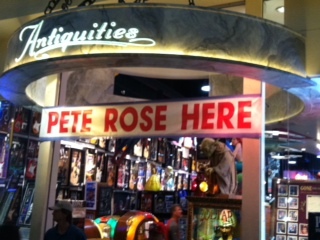 Below the entrance was a large white sign with red lettering that simply said “PETE ROSE HERE”. We decided to walk in and sure enough, about 20 feet inside the store there was the incomparable, how is this possible, 71-year old, Peter Edward Rose. Pete was set up at a table to sign autographs for any takers. If you were interested you were directed to the back of the store where you could purchase Phillies and Reds jerseys, bats, balls, pictures, cards and framing. They also ship anywhere and will provide certificates of authenticity for the items. Each comes at a price. Each purchase also provided you the opportunity to sit with Pete and have your picture taken and talk with him. The workers take your camera and shoot pictures the entire time he’s signing your items so you get about a dozen pictures. The business is a well oiled machine. My wife decided that I needed to have the Phillies jersey, which also came with the signed bat, as a Father’s Day present. SHE’S A GREAT WIFE!!! Of course I decided I wanted the Phillies jersey instead of the Reds jersey that had many statistics embroidered in it. I asked if I needed to tell him what to sign and I was told “Pete knows how to hit and Pete knows how to sign”. When they hand you your jersey and bat they are in wrappers that Pete opens for you at the table. The purpose is to keep the item from being damaged in any way. (They’ve pretty much thought of everything). As I walked up the table and sat down the first thing Pete said was, “how are you doing? It’s a great day.” He asked if I wanted the bat personalized to anyone, which I said “no.” He then signed his name, added Hit King and 4256 on the bat. While he was signing we started talking Phillies baseball. Pete is still a huge baseball fan and a huge Phillies fan. We talked about the present state of affairs with the Phils. Like most of the rest of us, he feels the same way we do, Pete stated “until (Jimmy) Rollins and (Shane) Victorino stop thinking they’re power hitters and start hitting for average, and getting on base, the team will struggle.” I think we’ve heard that before!! He also stated, “they should’ve never paid (Ryan) Howard the money they paid him. He struggles in the playoffs because he sees good pitching every game, in the meantime, he’ll hit 40 fastballs out of the park in the regular season.” Spoken like a true Phillies fan. It was very clear that Pete has been paying a lot of attention. 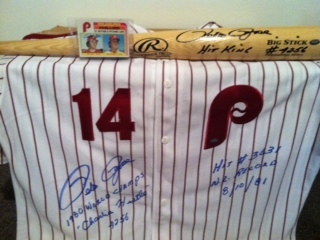 All the while, Pete was signing my Limited Edition Phillies jersey. He signed his name with 1980 World Series Champs, “Charlie Hustle” and 4256 on one side and Hit #3631, NL Record, 8/10/81 on the other side. By the way, this is the only place that Pete will sign “Charlie Hustle”. Don’t expect it at a memorabilia show. We bantered back and forth about Pete’s upcoming trip to sign autographs in Philadelphia this weekend, but first there was a trip to Cincinnati to watch the Reds against the Indians, then off to Philly and back to Vegas on Saturday evening. Pete is a busy man trying to stay involved in the game he loves while making money doing it. When everything was signed and the conversation ended Pete puts out his hand and offers a good handshake for the camera. With all of the signing complete you proceed to the final step of the journey. You go back to the desk where you placed your order and turn over any item that you want shipped. I kept the jersey with me and shipped the bat. They added a signed baseball card as part of the deal. The bat arrived at the house before I did in perfect condition. I have to say, even at my age, I was pretty excited to have had the opportunity to sit with the All Time Hit King in a one-on-one situation, even if it was for only 10 minutes and it came at a small price. After all, this was the guy that took the 1980 Phillies over the top. The Phillies would’ve never won that World Series if it wasn’t for Pete Rose. 4256 hits, 1st All Time. To put this is some perspective Derek Jeter, the most recent 3000 hit man, is still over 1000 hits behind Pete. 3562 career games played, 1st All Time. 254 ahead of Carl Yastremski. 14,052 career at-bats, 1st All Time. 1,689 ahead of Hank Aaron. 15,890 career plate appearances, 1st All Time. 1,898 ahead of Yastremski. 3,215 singles, 1st All Time. There are 15 members of the 3000 hit club that have less total hits than Pete has singles. 5,929 career times on base, 1st All Time, 330 ahead of Barry Bonds. 17 All Star games. Selected as a 2nd baseman, right fielder, left fielder, 3rd baseman and 1st baseman. Led the NL in Fielding Percentage as a RF once, 1970, as a LF, twice, 1972 and 1974, as a 3rd baseman, once, 1976 and as a 1st baseman, once, 1980. It’s a shame that Pete will never be inducted in to the Hall of Fame for his actions after his playing career, because his playing career is as good as anyone that ever put on the uniform and to this day, clearly, truly loves the game. 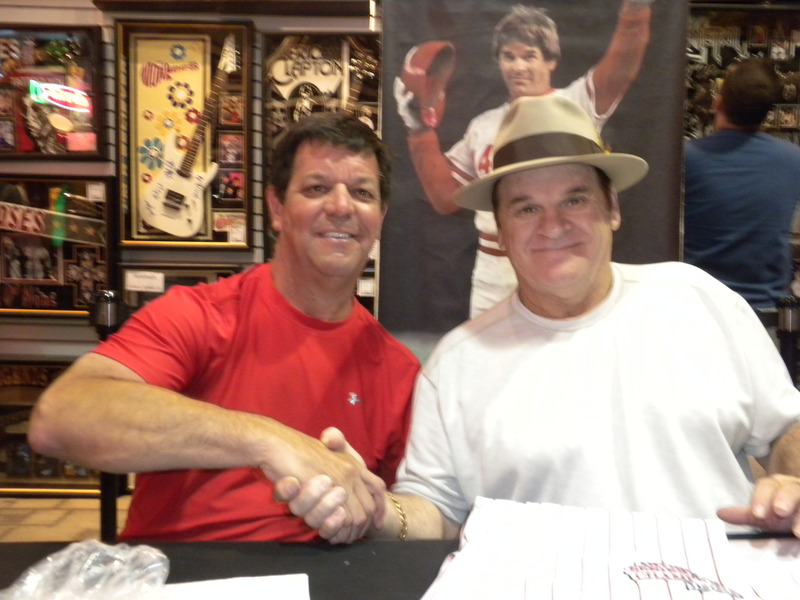 It was a lot of fun catching up with Pete Rose!! Phillies Injuries – Why & What’s the Effect?? As I watched Freddie Galvis limp down to 1st base last night running out a foul ball, try to get back in to the box, and take a feeble swing before removing himself from the game to become the 14th Phillie to go on the disable list (DL) since April 1 it made us think of why was this happening to the Phillies and was it happening to other teams? The Phillies fans and media have been discussing how the Phils have been besieged with injuries so far this season. The common theme is, when we finally get healthy we will make a run and win the division. With that in mind, the Philly Pressbox went to work doing some research on the injuries for each team in the NL East. Below are the “transactions” listed on each of the teams’ websites dating back to April 1, 2012 through today. We left transfers to the 60 day DL as an indication that the injury the player suffered was more than likely severe. We’re just providing the numbers and information of the injury and not trying to determine if a Ryan Howard injury is more significant to his team than a Ryan Zimmerman injury or Mike Pelfry being placed on the 60 day DL versus a Roy Halladay injury. The big question that comes to the top of the Philly Press box is this, why are the Phillies having so many injuries? Of the 14 Phillie injuries, 8 have been pitchers. Two of them, Contrares and DeFratus, have resulted in trips to the 60 day list. 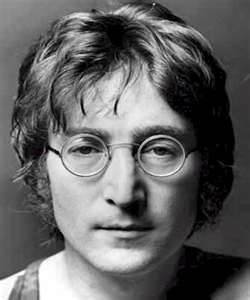 In Contrares case it will likely end his career. Of the remainder of the pitchers, Halladay and Cliff Lee, like Contrares, are getting older; however, Vance Worley, Michael Stutes and David Herndon are young pitchers. So what’s the common denominator? The 1st Place Washington Nationals have also had 14 players placed on the DL. Interestingly, of the 14 only 5 have been pitchers. They have had to place three different 3rd basemen and three different catchers on the DL. They have also lost Jayson Werth and Rick Ankiel to go along with Zimmerman since April 1st. The New York Mets are next with 10 players going on the DL. Of their 10, five have been pitchers, included two that transferred to the 60 day list. That brings us to the healthy teams, the Atlanta Braves and Florida Marlins. The Braves have placed four players on the DL and three of them were in early April, and included Tim Hudson who was recovering from back surgery. The only other player has been Chipper Jones, which is not unusual. Overall, the Braves have been extremely healthy. As far as the Marlins, they have added three players to the DL. One of them, Jose Ceda, is recovering from off season Tommy John surgery and was later transferred to the 60 day list. Overall, they have only put two players on the list since the season started. 5th Place – Phillies – 6 games back. Phillies Injuries 04/03/12 Philadelphia Phillies placed 2B Chase Utley on the 15-Day disabled list retroactive to March 26, 2012. Deterioration of the cartilage behind his left kneecap. Philadelphia Phillies placed RHP Justin De Fratus on the 15-Day disabled list retroactive to March 26, 2012. Right elbow sprain. Philadelphia Phillies placed RHP Jose Contreras on the 15-Day disabled list retroactive to March 26, 2012. Recovering from September 2011 right elbow surgery. Philadelphia Phillies placed 1B Ryan Howard on the 15-Day disabled list retroactive to March 26, 2012. Recovering from October 2011 left Achilles tendon surgery. Philadelphia Phillies placed 2B Michael Martinez on the 15-Day disabled list retroactive to March 26, 2012. Right foot fracture. 04/21/12 Philadelphia Phillies placed LHP Cliff Lee on the 15-Day disabled list retroactive to April 19, 2012. Left oblique strain. Philadelphia Phillies placed RHP Michael Stutes on the 15-Day disabled list retroactive to April 22, 2012. Right shoulder inflammation. Philadelphia Phillies placed RHP David Herndon on the 15-Day disabled list retroactive to April 30, 2012. Right elbow inflammation. Philadelphia Phillies placed 1B Jim Thome on the 15-Day disabled list retroactive to April 29, 2012. Strained lower back. Philadelphia Phillies placed LF Laynce Nix on the 15-Day disabled list retroactive to May 10, 2012. Strained left calf. Philadelphia Phillies transferred RHP Justin De Fratus from the 15-Day disabled list to the 60-Day disabled list. Philadelphia Phillies transferred 2B Michael Martinez from the 15-Day disabled list to the 60-Day disabled list. Philadelphia Phillies placed RHP Vance Worley on the 15-Day disabled list retroactive to May 12, 2012. Right elbow inflammation. Philadelphia Phillies placed RHP Roy Halladay on the 15-Day disabled list retroactive to May 28, 2012. Right back strain. Philadelphia Phillies transferred RHP Jose Contreras from the 15-Day disabled list to the 60-Day disabled list. Philadelphia Phillies placed 2B Freddy Galvis on the 15-Day disabled list. Lower back strain. Miami Marlins placed RHP Jose Ceda on the 15-Day disabled list retroactive to March 26, 2012. Recovering from April 2012 Tommy John surgery. Miami Marlins placed CF Emilio Bonifacio on the 15-Day disabled list retroactive to May 19, 2012. Sprained left thumb. Miami Marlins placed LF Austin Kearns on the 15-Day disabled list retroactive to May 23, 2012. Right hamstring strain. Miami Marlins transferred RHP Jose Ceda from the 15-Day disabled list to the 60-Day disabled list. Atlanta Braves placed RHP Anthony Varvaro on the 15-Day disabled list retroactive to March 26, 2012. Right pectoral strain. Atlanta Braves placed LHP Robert Fish on the 15-Day disabled list retroactive to March 26, 2012. Left elbow tendinitis. New York Mets placed SS Ronny Cedeno on the 15-Day disabled list retroactive to April 21, 2012. Left intercostal strain. New York Mets placed SS Ruben Tejada on the 15-Day disabled list. Strained right quadriceps. New York Mets transferred RHP Pedro Beato from the 15-Day disabled list to the 60-Day disabled list. New York Mets placed SS Ronny Cedeno on the 15-Day disabled list retroactive to May 27, 2012. Strained left calf. New York Mets placed LF Mike Baxter on the 15-Day disabled list retroactive to June 2, 2012. Displaced right collarbone. Washington Nationals placed C Sandy Leon on the 15-Day disabled list. High right ankle sprain. Washington Nationals placed RHP Ryan Mattheus on the 15-Day disabled list retroactive to May 21, 2012. Plantar fascia strain in his left foot. Washington Nationals placed 3B Chad Tracy on the 15-Day disabled list retroactive to May 27, 2012. Right adductor strain. Washington Nationals transferred RF Jayson Werth from the 15-Day disabled list to the 60-Day disabled list. Washington Nationals placed C Carlos Maldonadoon the 15-Day disabled list retroactive to May 30, 2012. Strained lower back. If you follow the Philly Pressbox (https://phillypressbox.wordpress.com) (@phillypressbox) you’re aware that we did a review and analysis of each Phillies player, Manager Charlie Manuel and the coaching staff leading up to Opening Day 2012. Now that the season has reached the 50 game mark there have been four additional players that are on the roster that we will get to know. We’ve profiled Jake Diekman, Raul Valdez and Mike Fontenot, today we will get to know Hector Luna. UPDATE: As the injuries keep mounting we will continue to profile additional players. Next up will be Michael Schwimer. Hector Luna –Luna has been bouncing around the major leagues since making his debut in 2004, at the age of 24, with the St. Louis Cardinals. Other than 2009 and 2011 he has been on a big league roster every other season. Hector originally signed with the Cleveland Indians as a free agent in 1999. He was drafted away from the Indians by the Tampa Bay Devil Rays in 2002, then returned back to the Indians in 2003. The Cardinals drafted him out of the Indians organization in the 2003 Rule 5 draft later in 2003. In 2006 the Cardinals traded him back to the Indians. In 2007 he was waived by the Indians and signed by the Toronto Blue Jays. He lasted only one year in the Blue Jays organization before being granted free agency. He was quickly signed by the Los Angeles Dodgers organization in December of 2008. Again, Hector only made it through one season with an organization. 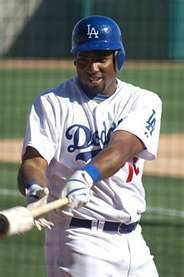 He was realeased by the Dodgers at the end of the 2009 season and signed by the Florida Marlins. Another year later, Luna was released by the Marlins and signed by the Boston Red Sox organization. Again, one year later, he was granted free agency before signing with the Phillies in December of 2011. To say it’s been quite a journey for Luna to end up in Philadelphia is putting it mildly. Interesting enough of the 8 organizations Luna has played for he has been in the major leagues for 5 of them, St. Louis, Cleveland, Toronto, Florida and Philadelphia. In the parts of the 7 seasons Luna has spent in the big leagues he has played in only 323 games. He has totalled 762 at-bats and 203 hits with a lifetime batting average of .266. He’s hit 14 home runs and has driven in 95 runs. What has kept Luna working is his versatility. He has played every position, except pitcher and catcher, at the major league level. He also acted as the DH at times in the American League. As a minor league player Luna has over 4000 plate appearances in parts of 11 seasons, mostly at AAA. He has a career .279 batting average. His big league numbers aren’t much different than his minor league numbers, he just hasn’t been able to stick. This is likely due to his lack of power, only 87 career home runs, and as he’s gotten older his lack of speed. Early in his career he was able to steal bases, 32 in 2002, but hasn’t had more than 7 in any of the last 5 seasons. Personal Analysis: The 32 year old Luna is likely a short timer with the Phillies as well. He’s done a decent job filling in at 1st base and occassionally in the outfield in the 12 games he’s played. He’s presently hitting .300 with one home run and 9 rbi’s. The feeling here is that as people start getting healthy and coming off the disable list that the numbers will catch up to Luna and he will ultimaetely be sent back to Lehigh Valley. Tomorrow we will preview Michael Schwimer. For those that haven’t followed our Phillies Profiles you can see them all in the archives file under “Phillies”.